The digital camera industry has been at a relative standstill when compared to most sub-domains within the tech industry. Both dedicated cameras, as well as those embedded in mobile devices, have been steadily upgraded with more megapixels, better sensors, improved flash and subtle software and hardware tweaks. None of this is real breakthrough stuff, though. With 360-degree capturing technology, the camera market looks set for a shake-up. Next-generation cameras, sensors and lenses aimed at the typical consumer market – including Samsung’s Gear 360 — differentiate themselves from traditional recording devices by capturing the complete environment, instead of placing the focus on a single object or person. 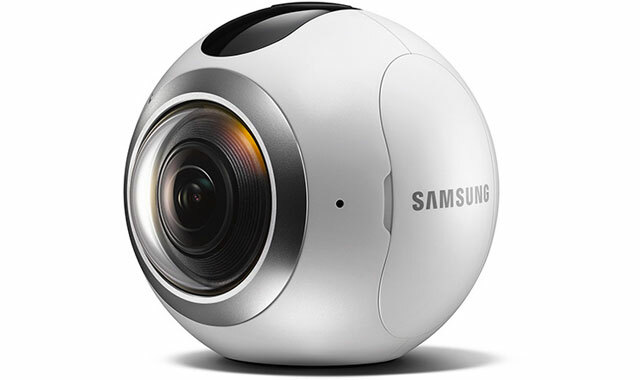 Where products like the somewhat older Ricoh Theta S and the relatively low-priced LG 360 Cam have already been on South African shelves for a while, Samsung is the first major brand to offer a relatively cheap, new high resolution (4K video) 360-degree camera. So, what’s the added value of having a camera that captures everything? The answer to that key question is quite straightforward: you won’t miss out on anything. It’s literally grabbing all it can, so you can focus on specific details later on. In order to do so, manufacturers typically use two opposing lenses. Each lens grabs slightly more than 180 degrees of its horizontal and vertical surroundings so there is some functional overlap. During post-processing, this overlap is interpreted to stitch the two images together using “smart” software algorithms on a mobile device or PC. 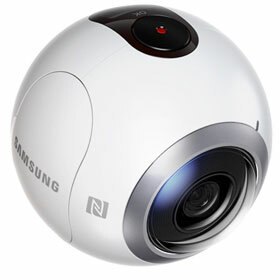 There are some 360-degree cameras that use just one ultra-wide lens, like the 360Fly (import only). The inherent downside of this specific approach is a blind spot, since, in the case of the 360Fly, for example, they tend to capture only 240 degrees in the vertical plane. On the other hand, the implementation requires no stitching whatsoever because only a single image is captured, effectively eliminating any stitching errors that might occur later on. A practical example in which a 360-degree camera can prove very useful is in the property market. The technology allows estate agents to capture every corner of a house, or piece of land, and show it to potential buyers through their website or social media sites such as YouTube or Facebook. Or what about immersing, impressing and informing friends, family or even colleagues afterwards with a recorded sporting event, musical performance, holiday or business trip? The use of 360-degree cameras potentially opens up a whole array of new possibilities that limited-angle cameras cannot. These cameras come into their own when there’s a lot of action being captured. When just a single person or object is involved, and the setting is otherwise uneventful, traditional capturing methods will most likely prove more effective. That doesn’t exclude the fact that with a 360-degree camera you can take some incredible soothing footage of a comparatively “dull” setting like a forest or beach. Nonetheless, when it comes to real-life applications, possibilities and concrete advantages of 360-degree technology, the sky is literally the limit. In contradiction to what many brands or media want you to believe, 360-degree capturing technology has next to nothing to do with virtual reality. There’s nothing virtual about the recorded footage, since it is a capture from actual reality. So next time you hear or read somebody, or some company, talk about VR when they are referring to 360-degree photography, know that they’re talking nonsense. A wise man once said: “…with great power comes great responsibility.” That same logic applies to the use of 360-degree cameras. The lack of clear focus and direction in 360-degree footage can have a negative impact on what professionals like to call “storytelling”. With traditional photography and filmography, the person that does that actual capturing has an idea of what he wants his audience to see and focus on, all in a clearly defined frame. An inherent problem that lies within 360-degree camera technology is that the viewer has to actively figure out where, when and what to look out for. This is not so much an issue with still 360-degree photography, but is with 360-degree video. Those that don’t mind looking for something to focus on have to wave around with their mobile device or fiercely scroll around in their browser to change perspective. Even then, inevitably missing out on some, or in the worst case, most of the action. Ultimately, viewing 360-degree footage is definitely not for the passive viewer who just wants to relax, sit back and enjoy the view. The Gear 360 features two fisheye f2,0 15-megapixel CMOS sensors able to capture a maximum video resolution of 3 840×1 920 in MP4 format (H.264 or H.265 codec). Still images are captured at 25,9 megapixels (2x15MP minus overlap) and stored in Jpeg format at a grand total of 7 776×3 888 pixels, initially weighing about 12MB/shot. Single 180-degree video footage is delivered at 2 560×1 440, while a one-lens photo has a resolution of 3 072×1 728, requiring roughly 6MB. Still images and video can also be captured at lower resolutions in case you’re short on space. The Gear 360 features two internal microphones for decent stereo sound later on, as well as near-field communication, Bluetooth and Wi-Fi (direct) support. 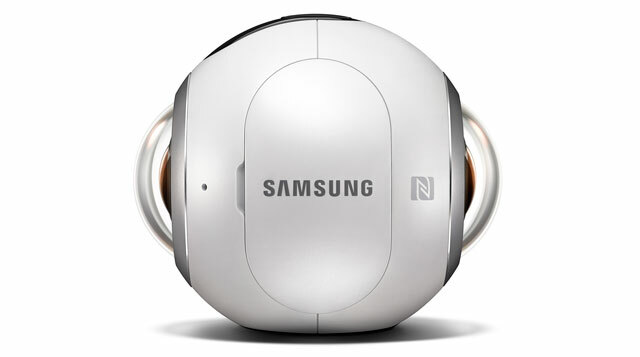 Bluetooth and NFC are primarily added to establish an initial connection with a mobile device, advanced tweaking and to remotely control the Gear 360. Wi-Fi, on the other hand, is best suited for subsequent transferring of recordings and live-viewing because of its higher maximum throughput. In addition, the Gear 360 features a removable 1 350mAh battery, which lasts around two hours when used for continuous capturing. It’s a good thing the battery can easily be swapped with a second (separately sold) one on the spot. The camera doesn’t come with built-in storage like some models from competitive brands, so it needs an additional microSD card (maximum size 128GB), adding up to the total price. Samsung claims IP53 certification, meaning it won’t immediately break when confronted with some dust and a splash of water. I wouldn’t recommend using it underwater or during a sandstorm, though. Samsung has said it will make a separate underwater casing available in the US and Europe later on. In order to collect metadata (for viewing purposes afterwards) of its surroundings — absolute movement and tilting angles, for example – the Gear 360 houses an accelerometer and gyroscope. There’s even a 0,5-inch OLED display that shows just enough information to operate and use the camera perfectly as a standalone device without a mobile device. In the end, the Gear 360 brings an impressive array of high-tech features to the table. The device itself comes with a small yet functional and easy to attach/detach tripod that uses a standard screw mechanism. As a result, the Gear 360 is easy to hold, placed stabile on a flat surface and can even be connected to helmets or vehicles. In total, excluding the tripod, the Gear 360 weighs 153g and has a 6,7cm diameter, measuring somewhere between a golf ball and tennis ball. In addition, Samsung supplies the Gear 360 with a carrying pouch that leaves a generous amount of room for a USB cable or extra battery. The device has a several modes of operation, as clearly communicated by the small display. They include video, photo, time lapse and video looping. You can even set it to single-lens mode, even though that completely defies the whole motivation for buying a 360-degree camera in the first place. Further tweaking of more advanced options like sharpness, white balance, HDR and ISO levels can unfortunately not be changed in standalone mode. To modify these settings, or enjoy a live preview, it requires the specific Gear 360 manager app, which currently only works on a handful of mobile Samsung devices. These are the Galaxy S6 (Edge), S7 (Edge), Note 5 and brand new Note7. The limited mobile app support is a substantial flaw of the Gear 360. Apart from this mobile app, the Gear 360 also comes with a product key for Action Director (Windows only). For this review, I’ve focused mainly on the Gear 360 as a standalone device — so without the help of one of the handful of supported Samsung mobile devices. Getting the Gear 360 ready for action is a breeze. It houses just three buttons. Two of them on the side, to easily and intuitively navigate through the menu as displayed at the excellent OLED screen, and one located on top of the Gear 360 to start/stop the capture process. To begin using the device, the first step is to supply it with a microSD card, preferably with as much storage as possible. After that, it’s best practice to have the Gear 360 format the memory card once-off before initial use, letting it create the proper filesystem and folder structure. When finished, after just a few seconds, the device is ready to use. Navigating through the various capture modes couldn’t be easier. The same goes for configuring the device. There’s no need to figure things out with the help of the manual. That is exactly what defines a great product. After you’re done capturing, files can subsequently be transferred using Wi-Fi, via supplied USB 2.0 cable, or simply by swapping out the microSD card. High-resolution footage, especially lengthy videos, result in large files, and taking out the tiny SD card can be quite a hassle. The USB option, therefore, brings the best of both worlds: it’s easy to connect and relatively fast. That same USB cable can also be used (simultaneously) to recharge the device. The image quality as generated by the Gear 360 is relatively good, but ultimately fails to impress in absolute terms. Because of the indirect 4K marketing claim put on the table by Samsung, you might expect crystal clear photo and video material each and every time. In practice, that unfortunately is not the case. Sure, when directly compared to other 360-degree cameras currently available in South Africa, it beats the living daylight out of them in terms of pure image quality and resolution. The fact of the matter is that, despite the 4K/30-megapixel resolution, image quality just isn’t always razor sharp. This becomes painfully clear when zooming in towards the edges of each lens capture. Image quickly gets blurry, not giving you that much hyped high-resolution feeling Samsung uses as one of the Gear 360’s unique selling points. The reason for all of this lies in the fact that, although each lens can capture 15MP, that number is evenly distributed over a much bigger surface, a wider angle, than traditional lenses. In the end, you’re always looking at just a small cut-out of a spherically shaped 4K video, or 30-megapixel, shot. That said, however, the Gear 360 outperforms its (current) competition. Initial recordings are only part of the story. The second half is about post-processing footage. Stitching the two captured photos or videos together can be performed either on a compatible mobile device, or a Windows PC using the Samsung Action Director tool. This latter piece of software, which Samsung borrowed from a company called CyberLink and partially re-branded, does a much better job at “intelligently” stitching the footage into a single output-file than its Android counterpart. This is mainly because PCs have more resources at their disposal. The Action Director software, weighing in at an incomprehensible 500+ megabytes, needs to be downloaded manually and is far from intuitive, fast and user friendly. It also lacks advanced editing tools. Unfortunately, the software is needed to make the Gear 360’s captures into cool images or videos that can be shared on social media. Currently, there is no easy way to get around it when you either don’t have one of the supported mobile devices or simply want the best possible result. Samsung hasn’t released a Mac version and probably never will. That’s a shame. The Action Director software creates a better end result, with less stitching errors, than the mobile app, but such errors remain visible in most cases. Inherently, one of the two lenses catches more light than the other because the sun’s angle, or any other light source for that matter. Action Director, however, is unable to always smooth those transitions out perfectly, leaving you with ugly stitching lines in some situations. In addition, the software doesn’t seem to cope with colour balance properly, ultimately resulting in one object, split-caught by both lenses, showing two slightly different colour tones. According to Samsung, a future Gear 360 firmware update, which can only be done using one of the supported mobile devices, should be able to address these issues. See first, believe later. In its defence, the level of these stitching and colouring errors actually getting irritating greatly varies from one scenario to another. Looking at this 360-degree ballet video, for instance, stitching errors are definitely present, but can only be seen if you know where and when to look. This dance battle footage, although clearly edited for the best result, doesn’t seem to show any stitching errors at all. The same goes for this pool game, which does, however, show some unbalanced colouring lines in the blue pool table, exactly where the two images are stitched together. Other promotional videos, which are traditionally too optimistic to be true, show the occasional stitching error and even blurriness in the lens corners. They are cleverly hidden (the closer you look, the less you see) and polished away. Other Samsung Gear 360 demo videos, like the ones over here and here, show a lower framerate in 4K resolution than when displaying in conventional 1080p HD, which is silky smooth. After telling the Action Director software where your captured footage is located, it automatically starts importing it into its library. Still images are almost immediately converted, while video may take some time to be processed. Depending on the specific hardware at your disposal, an eight minute 4K capture will generally take about 20 to 30 minutes to be processed. Back to the mobile app. According to Samsung, it only runs on a handful of Samsung devices because the post-processing requires a lot of computational power and they’d like this to happen on a device able to handle that heavy burden. Personally, I think this is a great example of vendor lock-in. 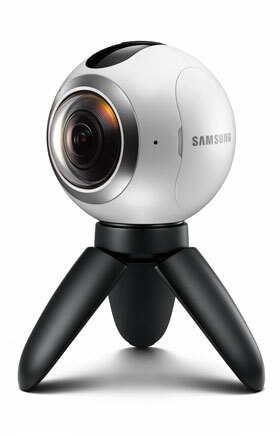 Anybody who functionally wants to squeeze the most out of the Gear 360 will need to buy a very specific, new and costly Samsung device. Technically, that argument doesn’t hold water. There are plenty of other brands offering equally powerful Android-based devices. Of course, for anybody looking for a 360-degree camera and who already owns one of the supported Samsung devices, the Gear 360 is a no-brainer. Putting Samsung’s argument, and my opinion, aside, the app’s output is worse than on any Windows PC using Action Director, displaying more stitching errors and simultaneously draining battery life quickly – not to mention the fact that the mobile device gets quite hot during post-processing the footage. Apart from all the fine-tuned 360-degree demo material Samsung put on YouTube, I also took the liberty of capturing my own photo and video footage in two completely different environments. Recorded material was post-processed using Action Director HE (V1.0.0.1718) with all settings left to their defaults. I did choose the highest possible output resolution, though, to show what the Gear 360 is realistically capable of. Both captured videos look pretty good when compared to the quality of other, similarly priced 360-degree cameras available in South Africa, but will most likely leave you disappointed in the end. The (indirect) 4K marketing label, which Samsung decided to put on the Gear 360, implies razor sharp and crystal clear video material, upping general expectations. As can be seen in the captured videos, actual 4K resolution still leaves a lot of room for improvement, not to mention the drop in framerate of anything above 1080p, including stitching and colouring errors here and there. For captured still images, I used Google’s Street View app to upload and actually publish them on Google Maps. Unlike the 360-degree video fragments, these photos show considerably higher quality, detail and sharpness. Just take a look at the captured beach photo here and house photo over here. Still, when directly compared to traditional cameras, either dedicated or integrated into a modern-day smartphone, quality simply pales. It seems that all of the stitching errors, both in photo and video material, primarily occur with objects that are close by. As expected, the difference in colours which co-create these visible lines, is generated by each lens receiving different amounts of direct sunlight. In all fairness, about 80% of the footage I took showed considerably fewer errors and inconsistencies, so in the limited testing period I had for the Gear 360, these represent pretty much the worst-case scenario. Once you’ve captured a 360-degree photo or video, why not share it with friends, family or colleagues? That way, they can immerse themselves into one of your particular moments in space and time. 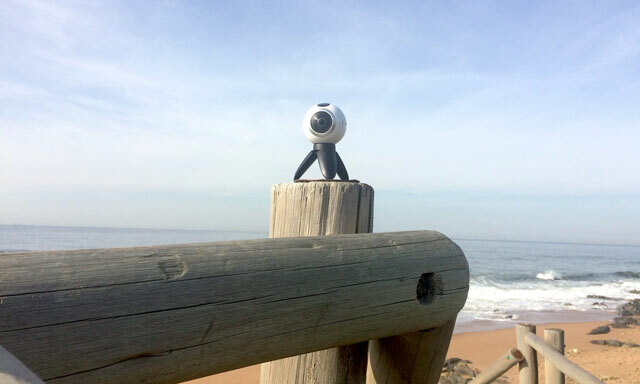 All of the Gear 360’s recordings can be shared on social media like Facebook, YouTube, Flickr and Google Street View. Unfortunately, the captured footage must first be converted by the Action Director software in order for the metadata to be recognised properly, and the captures to be uploaded to these social networks. If you own a Galaxy S6 (Edge), S7 (Edge) Note 5 or Note7 device, however, you can easily share everything straight from the app. This added functionality is an obvious reward on the part of Samsung for consumers buying their latest mobile devices. By default, uploaded 360-degree footage is played on YouTube using 1080p resolution, but can be set to 4K by manually selecting the 2160p option. Although the Gear 360-degree camera is far from perfect, with a number of flaws and limitations, these flaws can potentially be addressed by Samsung with future optimisation. Most of its rough edges are software related, like the limited mobile app support, stitching errors and colouring glitches, as well as the Action Director software itself. From a hardware perspective, the Gear 360 has a lot to offer, with the exception of fluent and razor-sharp video footage in 4K. Captured 360-degree photos, on the other hand, look very good. In addition, the Gear 360 delivers intuitive navigation, decent battery life, great design, an integrated screen, removable storage and a swappable battery. To top it all off, it’s also dust resistant and splash proof. Even if you don’t own one of the few supported Samsung mobile devices, the Gear 360 has proven to be an ideal standalone device and therefore offers the best value for money at this point in time if you are interested in buying a 360-degree camera.